The noise level of cheaper hotels in latin America is often the biggest problem (well, not counting the bed bugs that attacked a friend of mine and I during our stay at a $3 per night doozy in Puerto Viejo de Sarapiqui). On one particularly noise-ridden night in Buenaventura, Ecuador, I was so fed up with the audio intrusion that I was going to buy the loudest noisemaker I could find, like say a stick of dynamite, and set it off outside the door of my noisy neighbor at 5 A.M. My neighbor lucked out though, because the birding is so incredibaly good at the Buenaventura Reserve that I just didn’t get the chance to look for large caliber firecrackers. In any case, my first experiences at night in the high Talamancas were wonderful in all respects because I spent them camping out in the fantastic forests along the trail up to Chirripo (camping along the trail isn’t actually allowed and I don’t think you could get away with it nowadays which is a shame because it was the best high elevation birding I have ever had in Costa Rica). I saw nearly every highland specialty including the only time I have ever seen Maroon-chested Ground-Dove. 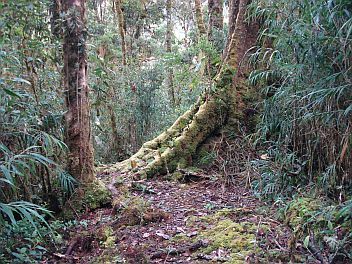 Since then, most of my visits to the high Talamancas have been to the easiest, most accessible, budget site for high elevation birding in Costa Rica; La Georgina. Situated along on the east side of the highway that connects San Jose to San Isidro de el General, La Georgina is a diner/truck-stop/cheap place to stay with excellent birding about 10 minutes after the pass on Cerro de la Muerte. The pass can be recognized by it being the most extensive area above the treeline-if you don’t visit Irazu, then this is where you stop for Volcano Junco. At 10,000 feet (slightly over 3,000 meters), La Georgina is pretty high up there for Costa Rica and you will feel it both in terms of the lack of oxygen and darn cold nights. It also rains quite a bit up there at La Georgina, as it did the other day when I made a day trip to the place despite the clear forecast. Although the foggy, misty weather pretty much foiled most of my attempts at bird photography, it was still nice to check the place out and especially nice to see that La Georgina has improved as a birding site. Unlike so many other birding sites in Costa Rica, La Georgina does not charge to use their trails, and still charges reasonable rates for lodging. The very friendly, humble family that runs the place still serves good, local food and the birding is still very good if not better than in the past. 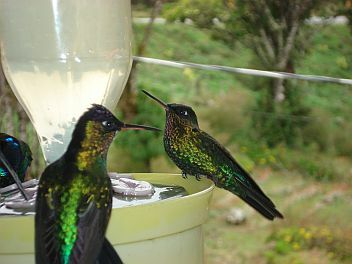 The dining area provides perfect views of Fiery-throated and Magnificent hummingbirds that visit their feeders. Extensive gardens have been planted that host Volcano Hummingbird, Slaty Flowerpiercer, and Large-footed Finch. This young Large-footed Finch was nice and camera friendly. 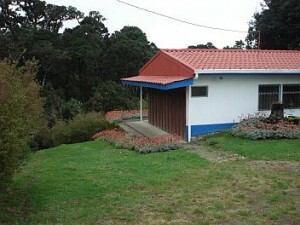 Two “cabinas” have been built that overlook the gardens and nearby forests. Lodging costs $30 per night. I believe this is per cabina and not per person although I am not 100% sure. It would be very interesting to stay the night here and try for Unspotted Saw-whet Owl. 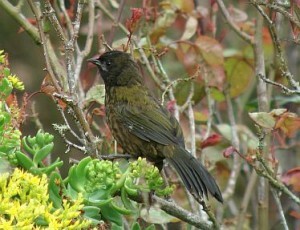 Almost no one has seen or heard this bird in Costa Rica; a subject that Robert Dean and I were discussing recently. We wondered if it might be related to these owls only vocalizing during a particular season, or possibly that they occur higher than the Savegre Valley (where most birders spend the night). If our second hypothesis explains the dearth of sightings of this bird, perhaps birders who stay at the cabinas at La Georgina can test this. In addition to the cabinas, there are $10 rooms available at the diner. Although the walls are thin, I think the few guests that stay here are too cold to yell to each other. About the only disadvantage of La Georgina is that one has to be fairly physically fit to walk their trails. Although the paths aren’t too steep, there is enough of a grade to make to make the going a bit rough, especially because of the lack of oxygen at 10,000 feet above sea level. Birders (and hikers) who are fit enough to do these trails, though, should definitely bird them. I have never seen a place where Zeledonias were so common. I must have heard and easily seen (sans binos mind you) at least 10 while walking the main trail. The trails at La Georgina mostly cut through old growth, temperate zone rain forest. Bamboo is prevalent in the understory and the trails go near a few streams. A testament to the high quality of these forests were the tapir tracks found along the trail. 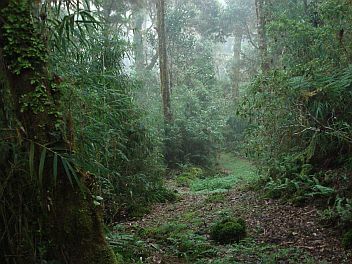 Essentially, this area is an extension of the huge La Amistad Park as the roadless, peopleless forests of La Georgina are connected to those of the park. They don’t get birded much although probably harbor all the high elevation specialties. As far as birds go, along the trails of La Georgina on that day, my best find was Costa-Rican Pygmy-Owl. 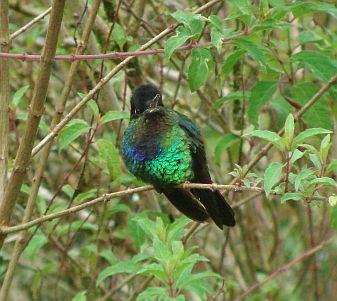 Like the one I had last year on Irazu, I found it by virtue of a pair of upset Fiery-throated Hummingbirds that were mobbing it. Just after the owl, I had a male Resplendent Quetzal. Unfortunately though, he was a lot more camera shy than the owl. Like other forested areas of the high Talamancas, Resplendent Quetzal is fairly common at La Georgina. 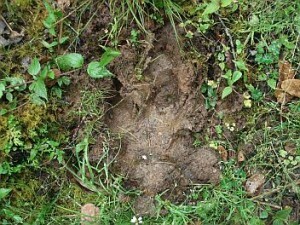 Come to think of it, I have never missed this species when walking their trails. A Fiery-throated Hummingbird that was happily relaxing in the gardens of La Georgina far away from any Pygmy Owls. I also had Black Guan, Band-tailed Pigeon, many Fiery-throated Hummingbirds, a few Gray-tailed Mountain-Gems, Hairy and Acorn Woodpeckers, Ruddy Treerunner, Buffy Tuftedcheek, Spot-crowned Woodcreeper, Silvery-fronted Tapaculo, Paltry Tyrannulet, Black-capped Flycatcher, Yellow-winged Vireo, Ochraceous, Gray-breasted Wood, and Timberline Wrens, Sooty Robin, Black-billed Nightingale-Thrush, Long-tailed Silky-Flycatcher, Black and Yellow Silky-Flycatcher, Flame-throated Warbler, Black-cheeked Warbler, Sooty-capped Bush-Tanager, Spangle-cheeked Tanager, Yellow-thighed Finch, Golden-browed Chlorophonia, and Rufous-collared Sparrow. 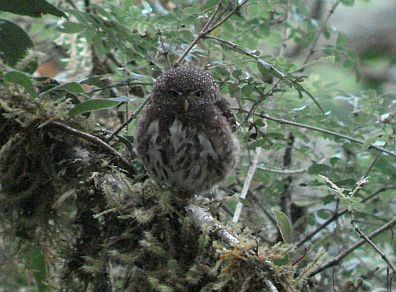 Hopefully I will get back to La Georgina sometime soon to spend the night and try for a mega lifer Unspotted Saw-whet Owl.